With a lot of unlockables and gameplay to offer, and a sense of polish that remains a decade later, this collection is highly recommended for both those who want to revisit old favorites and for those who want to see how the famous duo got their start. 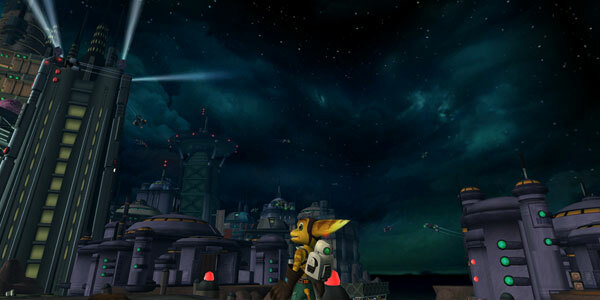 The Ratchet & Clank franchise has become a trademark for the PlayStation since its creation in 2002. Now, to commemorate the series’ 10th anniversary, the first three entries in the series, originally released on the PlayStation 2, have gotten an HD facelift for a collection of ports on the PS3. The result is a nostalgia trip for those who have fond memories of the series, as well as a great value for younger gamers who might have played the series’ more recent installments but never got a chance to see how it started. The collection includes the original Ratchet & Clank and its first two sequels, Ratchet & Clank: Going Commando and Ratchet & Clank: Up Your Arsenal. The fourth PS2 entry in the series, Ratchet: Deadlocked, is noticeably absent for reasons unknown. At the start of the series, the alien mechanic Ratchet is the first to discover Clank, who has been created with the purpose of helping to stop the plans of Chairman Drek, a pompous alien chairman who plans to rip chunks out of inhabited planets to form a new home for his race. By the time the second game rolls around, the duo are now celebrated heroes who find themselves with little action going on, until they are recruited by an eccentric executive to recover a stolen genetic experiment. By the third game, Clank is enjoying additional fame due to being cast as a Bond-esque secret agent on TV, which Ratchet resents due to only being cast as his limo driver. They soon discover that their home galaxy has been invaded by robotic mastermind Dr. Nefarious, and team up with several past allies to prevent him from exterminating all organic life. The basic gameplay is largely the same across all three games, with the most notable enhancements making their debut in Going Commando. The core mechanics are a combination of third-person shooting and straightforward platforming and landscape traversal. One of the series’ biggest trademarks comes in the varied and creative weapon lineup. While certain weapon archetypes are repeated throughout the games with different names and designs, like pistols, grenades and rocket launchers, there are numerous other devices with more outlandish effects. Some include summoning small robots who independently run up and attack enemies, ray guns that transform enemies into harmless farm animals, and a whip made out of plasma beams. The game’s method of encouraging players to experiment with every weapon comes in the form of the upgrade system established in the second game. When an enemy is killed, whichever weapon delivers the final blow gets some experience, and eventually levels up several times, dealing greater damage with each level. Once it hits a certain point, it will transform into a completely new version with additional capabilities. This system makes it so that players are encouraged not to stick to one weapon for the entire game, as they will always have additional weapons that need leveling up to strengthen their overall arsenal. A similar experience system is applied to Ratchet’s health. While he starts out with a small meter, he also gains experience and levels up gradually with each kill, extending the player’s max health and allowing Ratchet to take more hits. Unfortunately, these two features are absent from the original game, and it makes things feel a lot less robust. Despite continually throwing new weapons at me, I felt content to stick with two or three weapons for the majority of the game. Worse yet, the handy feature to strafe left and right while keeping your aim focused on enemies isn’t around either, making combat against large groups more of a hassle. The first game is still a good play, but it’s a bit harder to revisit after seeing how later titles refined the formula. Additions in Up Your Arsenal are less extreme. The main addition comes in several segments where the heroes join soldiers in several large scale fights against Nefarious’s armies. Here, players can take control of vehicles like cars and spaceships to give them an edge in battle. This mechanic sticks around all the way to the last boss fight, and while it isn’t bad, it just doesn’t feel as substantial a leap forward as what was added in Going Commando. Thankfully, what worked in the previous two games is otherwise kept intact, so it’s still a lot of fun to play. Up Your Arsenal also boasts the series’ first online multiplayer modes, which have been recreated to work in this compilation. The three modes include Siege, where players capture nodes on the field and work together to take down the opposing team’s base, as well as traditional Deathmatch and Capture the Flag modes. They’re serviceable, but unremarkable. The series’ control scheme makes things feel a bit loose and imprecise when carried over to multiplayer, and there aren’t any PS3 trophies or level-up perks to encourage replayability. It’s an addition that some may like, but personally felt like an insubstantial bonus. Another trademark of the series is in its characters, presentation, and overall personality. 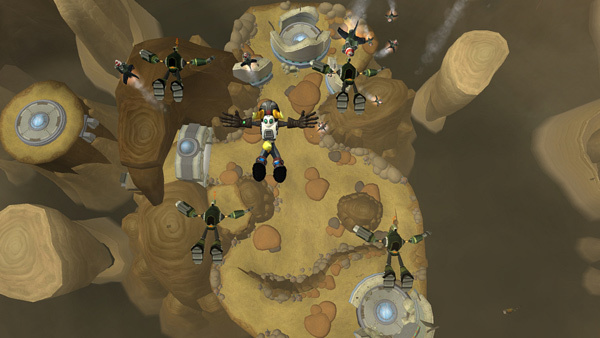 The fact that each level is an entirely different planet allows the designers to go crazy with different visual styles and layouts for each one, and even though it’s evident that the graphics here don’t take full advantage of the PS3’s horsepower the same way recent games like All 4 One do, they’re able to stand on their own due to creative composition. The only noticeable drawbacks come with each game’s pre-rendered cutscenes, which both have lower resolution than the gameplay and are in 4:3 aspect ratio instead of widescreen. The cast of characters is also large, with each one having individual personality traits and quality animation and voice acting. Some minor characters come off as more one-dimensional than others due to limited screen time, but they don’t stick around long enough for it to become very noticeable. The overall storytelling quality for each game varies in different areas. It’s nice to see the titular duo’s relationship develop in the first game, but Ratchet comes off a lot more short-tempered and blunt than in later entries – his statement of selling Clank for scraps after a disagreement comes off as overly harsh. The developers wisely have him mellow out in later entries, still giving him a hint of sarcasm but not making him as obnoxious. The second game, while delivering the highest upgrade in gameplay quality between entries, probably has the weakest and most straightforward plot, mainly due to the fact that it chooses not to reveal its main villain literally until the last boss fight. In comparison, Drek and Nefarious are memorable and comedic. In Drek’s introductory scene, he politely explains that he appreciates the cooperation of his target planet’s inhabitants as he prepares to slaughter them. Nefarious, on the other hand, is comedically over-the-top in his evilness, and has some good banter with his more level-headed assistant Lawrence. 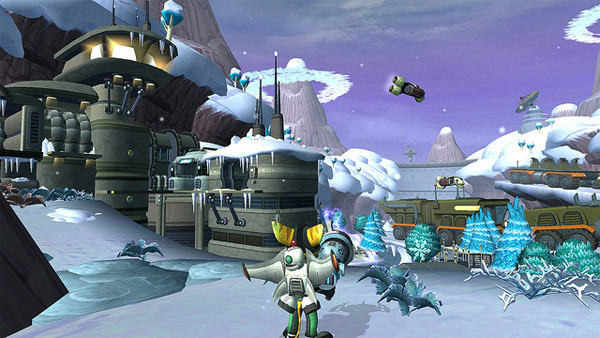 The series’ main recurring character, Captain Qwark, a pompous hero whose allegiance constantly shifts depending on what he thinks will most benefit his public image and endorsement deals, also delivers some good moments, including a fun side mode in the third title that resembles sidescrolling action shooters of old. The series rarely takes itself seriously, with almost every cutscene delivering several jokey bits of dialogue or visual gags. Bits that actually made me laugh out loud were uncommon (Ratchet’s reaction to a flashy pop video in the third title is definitely the funniest bit), but at the same time, there are few clunkers. It helps to give the series a personality and lighthearted vibe that keeps things fun and fresh. Despite the first game’s shortcomings now being more noticeable, and multiplayer being unremarkable, the three games in the Ratchet & Clank Collection are still plenty of fun. With a lot of unlockables and gameplay to offer, and a sense of polish that remains a decade later, it’s highly recommended for both those who want to revisit old favorites and for those who want to see how the famous duo got their start.